As you probably already heard there will a new version of the Microsoft Parallel Data Warehouse available in the first half of 2013. So let me quickly go through the highlights of Version 2. The new version will be based on SQL Server 2012 and will also include the enhancements of the column store index. This means Microsoft ships also in-memory technology within it’s product. Most of the T-SQL limitations that we know from version 1 will be also gone. Additionally the new version will have some architectural changes, a hardware refresh (HP EDW v2) and a new Quarter Rack, which is more attractive also for smaller Data Warehouse projects and customers. As you probably also heard from the PASS Summit PDW Version 2 will ship with Polybase. 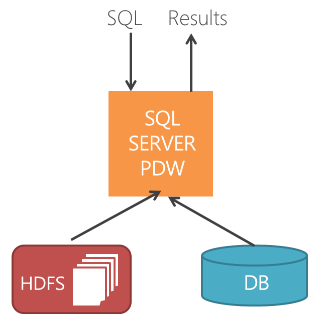 Polybase provides users the ability to query against structured data that is stored in PDW and unstructured data that is stored in Hadoop in the same way (T-SQL). This means that Parallel Data Warehouse is and will be Microsoft’s strategic Big Data Platform and Appliance that combines the scale and performance of a relational Data Warehouse with the velocity, variety and volume of unstructured data stored in Hadoop. And as Google already figured outNoSQL will not be the solution to handle all kind of data in a way that query performance will be acceptable by business users. If there is a certain structure in your data, you probably want to use it.